Super heavyweight License Plate Holder (Tag Bag) helps preserve and protect demo and temporary license plates during test drives. 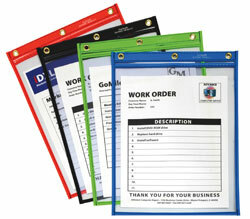 It's also great for protecting work orders and operator manuals when stored in rough conditions. The stitched edging expands the life of the holder by providing an additional layer of protection. Open on the long side, the holder stores oversized items, such as license plates, while keeping them secure with the hook and loop closure that runs along the entire edge of the top flap. Use the 24 inch hanging strap to attach license plates to a trunk or SUV back window during test drives or to store equipment manuals throughout a facility. Black edging with clear vinyl front and black back. The holder measures 14 x 9-1/4 and holds an insert 13 x 8-1/2. The clear display window shows plates measuring 13 x 7.